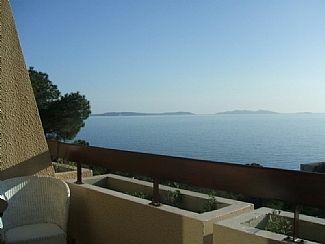 Flat in Rayol, which is between Le Lavandou and Cavalaire sur Mer. Set in secluded gardens in an area of splendid trees and shrubs. Close to beautiful gardens of Domaine du Rayol. Near shops in village and bus stop. Boat trips from Cavalaire to Porquerolles Islands. St Tropez 30 mins along coast road. Vineyards nearby. Lovely mountain scenery. Fragrant walks along unspoilt coast track. Great restaurants on beach and village. Peaceful, untouristy, safe beach. Balmy atmosphere. Although a car is not necessary, a parking space is provided near the flat.If you want to have loud parties all night on the balcony, this is not the place for you! The apartment is built down a mountain side and although it is on the third floor, you walk down 25 steps from car park to front door. The car park place is included in the rent, and is locked and gated. The bedroom has a double bed, the toilet is separate from the bathroom.The sitting room with en suite kitchen at one end is light and airy and gives on to the balcony with its stunning views. We are a family of artists, working in theatre, music and sculpture. The apartment is a wonderful place for us to unwind when work gets hectic. We love watching the sun light up the trees at dawn and the moon slide above the horizon over the sea. Swimming is our main sport,and the warm clear water of the bay is just what we need!! The good restaurants, the peace and fresh air are the simple pleasures that we like.PS The balcony is the place for sunsets. Peace and the smell of flowers. Sensational view. The surrounding area has small French villages to explore and round every bay there is yet another wonderful beach. Tiled bathroom. A hand basin and bath with shower at one end. Toilet in a separate room. There is a free car park space in an open air ,locked car park. Then you walk down 25 steps turn right and you come to the door of the apartment. Plenty of plates, saucers, bowls , salad bowls,pots,pans,cups,coffee mugs, jugs,glasses. the kitchen is built into the main room. It is a basic and fairly simple, functionally furnished kitchen. balcony has 2 comfortable grass chairs, a round dining table, a bench/bed with mattress for sunbathing. It also has a blind which creates shade if needed. The balcony views are wonderful. The flat is close to the beach, just 5 mins: it's a bit of uphill/up-steps coming back, but then one benefits from the view and a bit of a breeze. The flat is close to a patisserie and a small Casino supermarket, plus a butchers and weekly fishmonger visit. We did make one visit to the Intermarche at Lavandou, but could have survived quite adequately with the local stores. The flat is simple and well-enough equipped. It's true that some cupboards are locked [presumably with owner's belongings] but we found the storage space quite acceptable for our family of 4: mum, dad, teenage son, young son. Beach is smaller than at La Cavaliere, and pleasant enough. We enjoyed our week very much and would be happy to revisit! This is a fantastically located apartment - surrounded by beautiful wooded grounds adjacent to the extensive "Gardens of the Mediterranean" created in the early 1900s ( and well worth a visit in season); less than 10 mins walk downhill to 2 lovely beaches and a stones throw from a supermarket, excellent bakery, butchers and chemist. The views of the azure sea and distant islands (Ile du Port Cros well worth a visit)are to die for and can be enjoyed from the balcony with 2 chairs, a day bed and a useful wind-out blind which is accessed from a tiled living area/kitchenette with 2 further day beds with plenty of cushions for lounging. The kitchenette is more like a galley kitchen with fridge, double hob, table-top oven (similar in size to a microwave) a separate microwave, a coffee percolator and plenty of crockery, pots and pans etc. The owner is very helpful too. The place is obviously used extensively by a family and is pretty well equipped although the washing machine was not working during our visit in Sept 2016, and most of the cupboards are padlocked or full of household clutter, although annoyingly no bin liners anywhere (and no free plastic bags from the supermarket anymore!). The apartment itself is quite dated in its décor and a little shabby round the edges but the views and location make up for this. The bed in the bedroom is lovely and big (probably king size or bigger) but really quite hard, verging on uncomfortable for us. The cupboards underneath the bed make it impossible to get a larger suitcase or large wheely bag underneath so we had to store these in the lounge. A cabin sized bag would be fine though. The most annoying thing about this property was the lack of air conditioning. The description on the website specifically mentions that there is a/c and this was pretty important to us. There is NO a/c - just 2 noisy portable fans which just move hot air around and when we visited in early September it was 25 C at night with increasing humidity making sleep quite elusive at times. Secondly on a safety note, we had one set of keys between 2 of us, one for the outer door to this and a neighbouring apartment which always had to be locked, and the other for the flat itself. This meant that I had to lock my husband in the apartment building if I went out, which is not safe in case of fire. Even if the apartment door was unlocked anybody inside would still be locked into the exterior corridor. Please rectify this because its not safe. Spent a great week here in Le Rayol .. lovely accommodation .. close to bakery + shop .. brilliant beach .. what more could you ask for ! We have had two pleasant weeks here. Security for our car and at the address was very good. We were very lucky with our surrounding neighbours who were all French and extremly nice. They were also mindful of others and there was virtually no noise at any time. The charm of the place is the Calm and splendid views. The balcony is very comfortable with splenid views across the Park with its beautifull Trees, cactus and various other native flowers. Our meals on the balcony were a delight and so we didn"t eat out much as we preferred our table here and there was everything we needed to make simple meals from the Casino store and various prepared items to be bought from the market and other traders in the village. The Bedroom and bathroom were adequate and comfortable. The toilet was fine when we were there. The living room and kitchenette has been thoughtfully laid out and works well. Alexandra has created a comfy place to live with thoughtful touches such as mirrors near plug sockets and little shelves in the bedroom to put the morning tea on. Some of the kitchen equipment is quite old now but nothing was dirty when we stayed. In fact we found the plates etc to have really lovely designs and enjoyed using them. Steps to beach could be difficult for some but I am 72 and managed them OK. Use the Buses for St Tropez in the season. We hope to return again and certainly would recommend for two people. We stayed at the apartment in June this year (2013) and loved it so much we went back again in September. Its location is just wonderful. We could have just sat out on the peaceful balcony all the time looking out over the tree tops, to the blue sea and and the islands. But that would have meant missing out on local trips to Saint Tropez, Port Grimaud, some lovely hill top villages and of course the beaches. The boulangerie and local Casino supermarket are less than 5 minutes walk away so its just a short stroll to get the croissants for breakfast and then back to that balcony and view! Any downsides? If you get the great weather then I don't think there are any. However, if you have to spend sometime indoors then I think a couple of proper armchairs would make life more comfortable. people wanted the extra sleeping room. So we decided on very comfy straw chairs for the balcony instead of the uncomfortable plastic outdoor chairs. This is the third year I have spent a summer here with my family. It is, in my view, a very special part of the French coast which is fresh and unhurried. It is established and almost residential. The flat is ideal for summer living. A bathroom repair was needed and it was undertaken within a day. The agency are most attentive. The property, although older is well maintained and it is very easy to walk to the beach and along the marked footpaths. Restaurants are good and local shopping is excellent including a book shop with a well chosen selection and a full range of papers and magazines. Musical events happen nearby. One can live here as we do, without a car. We use the local bus and two weeks is all too short. Polo near St Tropez. Horse riding near Cavalaire. Bike hire Le Lavandou, Cavalaire. Jet ski at Le Lavandou. A few mins walk down steps and road to a lovely, sandy safe beach, with beach bar and restaurants and a place to park a car. The ornamental steps leading down to the beach with tubs of flowers are of historic interest. The sea is always clear and clean. Ideal for children and adults, if adventurous, can swim to the next bay!There are 2 beaches ,separated by a hotel. BOTH are public beaches. The beach on your left (facing the sea)has FREE PLASTIC CHAIRS. Airport bus leaves at 3.30 (direction St Tropez) to RAYOL TOURIST BUS STOP.. Walk in the direction of the bus for a few mins to gates of Parces du Rayol on right.You will need the gate code for access. Eurostar to Paris or Lille change for SNCF to Toulon. Bus 7801 from Toulon station to Rayol. Bus Company is Varlib.Flights to Marsailles, then train to Toulon and bus to Rayol. St Tropez approx 30 mins by car. Toulon approx 40 mins by car. Rayol village with all necessary shops a few minutes walk. There is an excellent bus 7801 which runs all the way along the coast between Toulon and St Tropez. You can stop at many different beaches, restaurants and sights along the way. A car in not necessary. Classical music festivals and Jazz concerts all along the coast between mid July and mid September. Sparkling clear sea ideal for snorkelling. The flat is very close to the world famous Botanical garden DOMAINE DE RAYOL. Booking Notes: Lettings start and end on Saturday. Tenants have to leave by 10 am and can take possession from 3 to 6 pm. If linen is required you pay the agent in Euro on arrival.CANCELLATION Its best that you take out your own insurance in the event that you may cancel. If you do cancel you will lose your deposit.The balance will be refunded if we get a booking for the week you cancelled. Changeover Day: Departure before 10am. Arrival from 3pm to 6pm on Saturdays. Notes on prices: Prices are for the property per week in UK Pounds or Euro Equivalent. £30 discount for 2nd week. Discounts for long winter lets by negotiation. Electricity charged for heating by meter in cold months. Linen, 25 Euros per person.